As a young college student I was introduced to Solzhenitsyn through the film based on his book, One Day in the Life of Ivan Denisovich. I was completely enthralled. I’d already developed a love for Russian literature through reading Fyodor Dostoyevsky and Boris Pasternak. So I plunged into reading Denisovich, August 1914, and The First Circle. By that time my global awareness was growing, and I learned of Solzhenitsyn the dissident. When his The Gulag Archipelago was published—it was a global sensation. Aleksandr Solzhenitsyn talks with reporters in 1974. Photo by Bert Verhoeff, now in the Dutch National Archives at the Hague, shared via Wikimedia Commons. 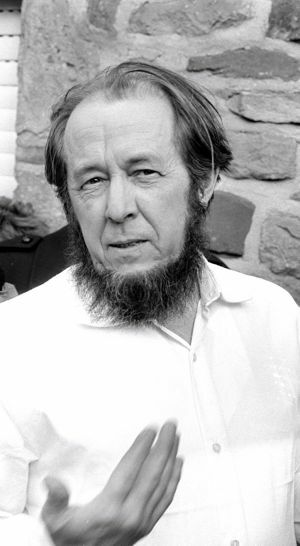 The bearded visage of Alexander Solzhenitsyn made him appear like a ancient Jewish prophet or Russian Orthodox patriarch as he exposed the evils of the contemporary Soviet Communist system. He was one of the few voices of dissent within the Soviet Union that was also heard outside. He became a global figure speaking about the plight of the unknown and hidden people who suffered by the millions under Soviet Communism. Solzhenitsyn‘s major work was The Gulag Archipelago, a massive documentation of the vast Soviet system of prison and labor camps that stretched through Siberia. Dissidents, ethnic minorities, and various religious adherents disappeared into this monumental network of camps and communities for internal exiles. Solzhenitsyn wove together history, personal accounts, and philosophical analysis in what some call one of the most consequential books of the 20th Century. Solzhenitsyn knew about the Gulag first-hand. He was arrested while serving in the Soviet Army in 1945. He had begun to have doubts about the Communist system and voiced opinions taken as derogatory in letters to a friend, calling Joseph Stalin “the boss” and “master of the house.” He was sent to the notorious Lubyanka Prison Moscow, interrogated, and sent to various Siberian labor camps for 8 years. Following the end of that sentence he was forced into political exile in Kazakhstan. He developed cancer that went untreated and almost killed him. When he was finally admitted to a hospital in 1954 he got the treatment he needed, and his cancer went into remission. His experiences in the camps and exile provided the material for his major novels. In an earlier short novel Solzhenitsyn gave an intimate look at the Gulag. One Day in the Life of Ivan Denisovich portrays a range of characters trying to survive amid the dehumanizing conditions of their imprisonment. It is a grim story, but one in which the author shows life and goodness still struggling to be expressed. The characters in The First Circle were based on people he met. It was first published in a self-censored version that was later revised and released in English in a 2009 edition. However, in 1962 One Day in the Life of Ivan Denisovich was published with the expressed permission of Khrushchev. In defending his decision to the Politburo the Soviet leader said, “There’s a Stalinist in each of you; there’s even a Stalinist in me. We must root out this evil.” It was an instant hit in both the Soviet Union and in the West. With Khrushchev’s ouster in 1964 Solzhenitsyn’s space to operate closed down. The publication of his books was halted. The KGB began to harass him and seized many of his manuscripts. Solzhenitsyn was secretly writing what would become The Gulag Archipelago, hiding portions of the manuscripts with various friends. The KGB attempted to murder him with a biological agent that left the author seriously ill. In 1970 Solzhenitsyn was awarded the Nobel Prize for Literature. In the granting of the award the committee honored him “for the ethical force with which he has pursued the indispensable traditions of Russian literature.” This deep literary tradition, a driving moral vision, and prophetic courage were the hallmarks of his work. He wouldn’t leave the Soviet Union for fear of not being allowed to return. He was finally personally awarded the prize after his exile in 1974. The publication of The Gulag Archipelago in the West in 1973 was the last straw for the Soviet authorities. In 1974 the KGB arrested and deported Solzhenitsyn to Germany. He was accused in the Soviet press of “choking with pathological hatred for the country where he was born and grew up, for the socialist system, and for Soviet people.” He came to the United States, eventually settling in Vermont. At a distance within the Soviet Union he was a hero for the West. But once he had come to live in the U.S. his Orthodox faith and Russian nationalism was at odds with what people wanted him to be. He loved democracy, especially in the grassroots form he found practiced in New England. But he critiqued the spiritual shallowness and narcissism of Western culture, which led many people who once loved him to regard him as too reactionary. Also, many viewed him as anti-Semitic. Though he criticized Russia for anti-Jewish pogroms, he thoroughly castigated revolutionary Jews for playing key roles in the Russian revolution and the rise of Communism. Almost everybody saw something in which to take offense in Solzhenitsyn’s writings or speeches. In 1990 Solzhenitsyn’s Soviet citizenship was restored. Then in 1994 after the break-up of the Soviet Union he returned to his native Russia where he died in 2008. He continued to write and speak out about culture and politics until he died, still a figure of controversy.